Message From the President – Our Dynamic Web Site – is it Enough? Dynamic. A word that can be used as an adjective – characterized by constant change, activity, or progress or as a noun – a force that stimulates change or progress within a system or process. Both I feel describe our web site. Our dynamic web site is in a state of constant change, with Club information being posted via blogs, Club meeting minutes, new rides being added to the Out of Bounds section and to the Ride Calendar. It also helps to stimulate change by introducing members and non-members to the things that the Club does and is involved in such as our four major events, blogs about rider safety, and tips for the novice cyclist to name a few. Ride Calendar for Viewing navigates you to a secondary website to view the calendar (this is the traditional view we have utilized in the past). Ride Calendar for Editing navigates the Club’s Ride Leaders to that same secondary website to post and update ride information. WCBC-Rides – Calendar-style displays the typical calendar view by month within a window on the WCBC website. NEW! 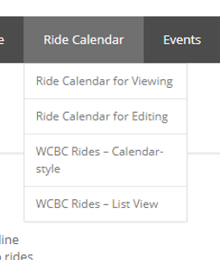 WCBC Rides – List View displays a list of rides for a month categorized by day within a window on the WCBC website. NEW! At the monthly Club meeting last night we were discussing things that we, as a group, felt should be located on the Club’s home page to make it easier for the user. A direct link to Membership and another to the new Club kit web store were discussed as two options, which have already been added. I was wondering if there should be more? More direct links? More changes that are needed? As an end user what would you like to see on the website? How do you use the Club’s website (www.whiteclaybicycleclub.org)? Is there too much content? Not enough? Are there too many words, too much in the way of graphics? I would like to make the website more user friendly while making it a better tool for the Club member. I want it to be one of the focal points of Club membership communication and have been working on this for a little more than a year now to host and post current and past Club information. I would really appreciate some honest and constructive criticism of the website. What you like and don’t like? What is easy to do and what is frustrating? Whether you have the answers to help to resolve what you criticize is irrelevant, I’d like to know where we are failing the membership with the website as well as where we are doing well. Please forward all of your feedback to me at president@whiteclaybicycleclub.org. I sincerely look forward to hearing from you!